Mankind always dreamed about immortality. And now, finally, it will receive it in the cycle of Correction after the Transition. In this cycle will be only two grades – hell and paradise and it will be incredibly long. It is considered that humanity will gain in it immortality... From day to day the boot of Italy, as the final phase of the apocalypse, will march around the planet, crumbling continents and erasing whole countries in the blink of an eye from the face of the Earth. Today, each of us has a last chance to significantly reduce his immortality in hell. There is only one way – charity. Give time, food, clothes, books, money, help. Return all your debts. Give everything from the soul and with joy, helping yourself, thereby, to provide more easy immortality. In order to feel more sharply the conditions of future immortality for the majority of us, look at the burning hot lava, peer at it and ... give, give, give... We have given to you the entire open part of the Information, received from the Above. Now we are just waiting for the beginning of the main blows of apocalypse, in order together with you to begin the struggle for the continuation of life under the Instructions of extraterrestrial civilizations at the beginning of global cataclysms. NOT BE LATE WITH THE TRANSITION! Apocalypse already started up. The staggering power of its blows will cause shock, fear and panic of civilization, an overwhelming hopelessness and doomed obedience. However, to these feelings of despair we cannot obey. To mankind already was given from the Above the only way of salvation - the Transition to the Highest level of the material world for continuation of life through the General Resurrection, as well as Instructions for its realization. In the turbulent future events each of us, in spite of everything, constantly and very strictly has to remember the main goal – life of civilization has to be continued! Audible across the whole Earth the gnashing of tectonic plates breaking North American continent before the first preliminary cataclysm, resembling the sound of a shofar, as the call to the Transition. It's life important not to be late! The categorical ban on the use of the Russian national flag at the Winter Olympics Pyeongchang 2018 and its replacement on the Olympic flag marked the beginning of the predetermined from the Above mission for Russia of saving humanity from the deadly blows of the apocalypse. So, the international community handed to Russia the banner of the Transition. This means that the cataclysms of the apocalypse, breaking up and destroying entire continents, will begin, most likely, already this year and it is Russia that will offer mankind the only way of salvation. For simultaneous acquaintance of all mankind with radical changes in its life, the largest international event – the Olympic Games – was chosen from the Above. As a result, all people of the world with their own eyes suddenly saw the beginning of new mission of Russia and clearly delineated boundary between the past life and the beginning of incredibly hard struggle for its continuation. Extraterrestrial civilizations through Russia reveal to mankind the scenario of the apocalypse and the only way to salvation. The state of the planet today demonstrates complete readiness for the beginning of blows of the apocalypse of incredible power and necessity of the Transition of civilization to the secure Highest level of the material world for continuation of life. The basis of the Transition is the action of the united consciousness, represented by the sign of Power. This sign was given to mankind from the Above already in prehistoric times and has the ability to operate the consciousness of people. The sign of Power became secret and was used by rulers to achieve power, wealth, health and beauty. It was carefully hidden from most people. About the great secret of the sign of Power knew Nostradamus, «The time will come, and the great Power will be available to all people, and the golden age of mankind will come, and it will last forever.» Today this time has come, and extraterrestrial civilizations gave mankind the detailed Instructions how to use the magical power of the united consciousness action to achieve the golden era of immortality. The action of the united consciousness manifests the Menorah – one of the oldest symbols of Judaism. Many predictors believe that in 2018 the world will face global changes and severe trials, as preparation for a very tough period of survival. Countries expect strongest earthquakes and tsunamis, as well as volcanic eruptions. The Third World War is possible. As a demonstration of future catastrophes a new type of frightening clouds appeared, creating the impression of being under the surface of a raging ocean. Extraterrestrial civilizations warn about the beginning of the destruction of the Earth by global cataclysms. Elena Roerich reports that Russia is the spiritual center of the Earth, determined by the Higher Powers. It is Russia that will show mankind the way for salvation and continuation of life. Today, at the eve of global cataclysms' beginning,the assertion of Marina Popovich - legendary military test pilot, as well as many famous scientists and researchers, pilots and cosmonauts about the existence of extraterrestrial civilizations is especially important. Extraterrestrials indicated to mankind the only way for salvation and continue life - the Transition on the safe Highest level of the material world through the general resurrection. With this purpose, extraterrestrial civilizations gave mankind detailed Instructions for the Transition, represented by the symbolic of consciousness. They presented the Instructions in numerous stone complexes built around the world, which formed the System of Information Transmission. Russian scientists Victoria Popova and Lidia Andrianova decoded these Instructions with the help of given from the Above the two keys to the symbolism of consciousness. Extraterrestrial civilizations in the complex Ta-Prom through the image of stegosaurus and other prehistoric animals designated the time when they got acquainted with the planet Earth - 20-25 million years ago. They many times very clearly show to humanity the image of the number of the Beast, which manifests the imperfections of the consciousness of mankind and represents a mortal danger for the Transition. The work of extraterrestrial civilizations is proved by the symbolism of consciousness, which represents all images, as well as the information technologies, by which this complex was created. The faces of Bayon are humanity in a state of meditation, which united consciousness for the Transition. Thus, the last stage of the struggle for the continuation of life is demonstrated. Towers with Faces contain three levels of information on height.Synchronization of consciousness through breathing to create a uniformly resonant environment of consciousness reveals the Terrace of Elephants. The apocalypse consists of two phases. The first of them is the rapid restructuring of natural processes as a result of quantitative and qualitative transformations. The second phase is the beginning of natural blows of incredible power. The decoding of the complex of Bayon marks the beginning of the second phase. Created by extraterrestrial civilizations, the stepped pyramid Koh Ker, known as pyramid of death, resembling by its shape the Mesoamerican stepped Mayan pyramids, warns humanity about the epicenters in the Gulf of Mexico of the first and second preliminary cataclysms of the apocalypse, where many similar pyramids are located. These cataclysms will destroy many countries of Europe and Asia, will split and almost completely destroy the North American continent. The pyramid of Koch Ker reveals Earth civilization the only way to continue life through the Transition to the parallel Highest level of the material world and the general resurrection. All information is transmitted through the symbolism of consciousness. Apocalypse is a short period in the life of humanity before the onset of catastrophes of a planetary scale. Extraterrestrial civilizations inform in details about future events in the presented complexes. They argue that humanity has no more time to resettlement to other planets, and there is the only one way to save life – the Transition. Mega tsunami and wings of the Transition, flames of the flash of the laser beam and flowers of love, determining the relationships on the planet - all these major milestones of the last period in front of the line of the Transition are presented in Preah Vihear and Angkor Wat. The complex Preah Vihear is the prototype of the future events of the apocalypse and a warning to the young mankind. The Transition on the safe Highest level of the material world mankind has to make in accordance with the Instructions of extraterrestrial civilizations before the second preliminary cataclysm. If in Angkor Wat extraterrestrial civilizations reveal in details the Instructions for the Transition and indicate the dates of the first two preliminary cataclysms, then in Preah Vihear is presented the chain of all major blows of the apocalypse.In addition, in the province of Preah Vihear there is a stepped pyramid of Koh Ker, known as the pyramid of death. And this is not surprising. The pyramid of Koh Ker informs about the epicenter of the first two preliminary cataclysms in the Gulf of Mexico – located in Cambodia, it has the shape of the Mesoamerican stepped Mayan pyramids, placed in region of the Mexican Gulf. The information is presented in three parts. Part 1. Preah Vihear. By the road of apocalypse. Part 2. Preah Vihear is the prototype of the apocalypse’ events. Part 3. Tsunami of apocalypse and the wings of the Transition. KohKer. 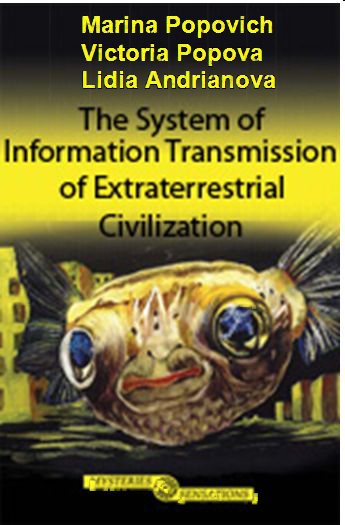 Informationtechnologiesofextraterrestrials. Countless serpents of Angkor Wat presented as bas-reliefs and statues, covering roofs and entrances with their bodies, as well as rising to the top of the towers, warn the Earth civilization of the hidden threat of destruction. They warn about fury of global cataclysms and call upon humanity to unite consciousness for the Transition on the basis of mutual understanding and love. This information is especially important today on the eve of apocalypse beginning. Numerous mound fields, located in the form of circle grid around Angkor Wat, discovered in a result of laser scanning of the earth's surface under thick jungles, inform about the necessity to unify consciousness of mankind for continuation of life. This is the quintessence of the information transmitted by Angkor Wat, which gives these mound fields the incredible power of the summoning. With what goal, why and how – to all these questions answers Angkor Wat. Thus, without decoding of Angkor Wat, the content of the pictograms of the mound fields and spirals is meaningless. The Mystery of steppe geoglyphs of Turgai; the geoglyphs discovered after deforestation of the tropical forests in the Amazon basin and on the bottom of the dried-up Aral Sea, and also the Nazca Lines, reveals symbolic of consciousness All geoglyphs call upon humanity to unite consciousness for the continuation of life. The information transmitted by the symbolic of consciousness warns about the imminent death of civilization while maintaining the individual mode of consciousness. This information is especially important today on the eve of the onset of global cataclysms on the planet. Solar effects on the 13-th towers reveal the dates of the three preliminary cataclysms of the apocalypse. The complex Chankillo also calls for unification of consciousness of civilization for the Transition and continuation of life and gives the brief Instructions. Thus, the 13-th towers Chankillo is the observatory of warnings. Nostradamus claims that 5777 year on the Jewish calendar that already has come, and the upcoming 2017 – is start time of the strongest catastrophes on the planet. «Сommon blood will flood the earth, people will live with closed mouths and unpredictable will come» i.e. radiation, as the result of destruction of nuclear power plants. It's the time when «the dead will rise from their graves». E. Cayce reinforces this information by the prediction about the 44-th President of the USA, as the last. Casey's prophecy indicates that in the period close to the date of inauguration of the 45th US President on January 20, 2017, has to occur a natural disaster of incredible power.Most possible that it will happen in Italy, where according to the prediction of saint Malachy before the apocalypse will be destroyed Rome-Vatican. Prophets endow Russia the great role of savior of the world and all of humanity which will transit into the new stage of evolution. Today, the San Andreas Fault has become world famous due to the expected catastrophe - the historic MegaQuake accompanied by a tsunami. However, extraterrestrials and the predictions of Edgar Cayce inform that the San Andreas mega-earthquake in the western part of US is not a separate event, but the beginning of a chain of cataclysms of apocalypse. This is a preamble of the first of three pre-cataclysms of the End of the World, more powerful and destructive, which already as mega tsunami will hit the eastern part of North America. Despite the predictions of E.Cayce about the last 44-th President of the US, cataclysms of the apocalypse possibly will not begin this year. Despite of E. Cayce' predictions about the last 44-th President of the US, cataclysms of the apocalypse possibly will not begin this year. However, the date that he pointed, means that they are already on the threshold. Extraterrestrials not give the year of the beginning of the apocalypse, but they present the scenario of these events. The Olmec colossal heads on the Gulf Coast - from the crater of the cataclysm - indicate on the obelisks of Africa, which depict the laser beams created by the by the united consciousness of humanity for the Transition on the Highest level of the material world as the only way of salvation. The ornament of the Obelisk of Aksum through symbols of consciousness transmits the detailed Instructions that include the creation of homogeneous- resonant structure of the united consciousness of civilization, as the main stage of the Transition, based on mutual understanding and love. The predictions of Edgar Cayce about the last the 44-th President of the United States means that the blows of the three pre-cataclysms have to start this year. That is why, the creation of the laser beam of incredible power that depicts the Obelisk of Aksum, is the major goal of humanity for the continuation of life. Disclosed dates of three pre-cataclysms, which will occur within one year before the beginning of global. Start of cataclysms will define strong blow, which will destroy Rome, according to the prediction of St. Malachy. This blow will happen either prior to the first pre-cataclysm, or immediately thereafter. The purpose of this blow is to inform humanity about the produced from the Above replacement of the Keys of the Kingdom of Heaven. The first and the second pre-cataclysms will occur one after another in the nearest to the destruction of Rome days of autumn and spring equinoxes, respectively. Between the first and the second pre-cataclysms it is necessary to make the Transition to the safety Highest level of the material world, in spite of the high levels of radiation, which will arise on the planet after the first pre-cataclysm. The third pre-cataclysm will occur in the date of summer solstice, almost during one year, after the blow in Rome. Disclosed dates of beginning of preliminary cataclysms indicate that these events are very close. Knowledge of pre-cataclysms dates will allow humanity to win the fight for the continuation of life through the general resurrection. The Parthenon and other ancient Greek temples, which ornaments contain triglyphs-tridents with guttaes, as well as rock cities Petra in Jordan and Mada'in Saleh in Saudi Arabia was built by extraterrestrial civilizations. This statement is based on analog and digital symbolic of consciousness of extraterrestrial civilizations presented in ornaments of all these complexes with the main symbol – a trident and guttaes, which form the block «666». This block, known as «the Number of the beast», warns humanity about mortal danger for the Transition into the new cycle of life deep individuality of our consciousness of carbon nature. However, the most important, the block «666» reveals the only way for salvation in global cataclysms under the unification of consciousness for the Transition. Complete identity of the ornaments of the Parthenon and Petra is the guide to action. Extraterrestrial civilizations had built on Earth two types of complexes. Some of them, warning about mortal danger, are giving the dates of three preliminary cataclysms, others - show the way to salvation. World famous Petra in Jordan - the seventh wonder of the world – by warning of the mortal danger of the future, does not indicate the dates of the pre-cataclysms. Petra transfers to humanity the detailed Instructions for the Transition. Based on the dates of pre-cataclysms and the Instructions, mankind will be able to continue life in the beginning of global cataclysms. The abdication of Benedict XVI is artificially interrupted from Above process of 111th Pope reign for appearance of the 112th pope «Peter the Roman» - the Russian scientist Victoria Popova with the mission of civilization’ salvation from global cataclysms using given from Above two new keys of heaven. So, the hope of the world will come from Russia as Edgar Cayce predicted. These two new keys to the symbolism of consciousness are needed to read the Instruction for the Transition of mankind to the kingdom of heaven – the Highest level of the material world into a new cycle of life through the general resurrection. The Transition through the united consciousness is the only way of salvation given from Above. New keys given from Above is the main criterion for the recognition of «Peter the Roman». However, the emergence of the 112th pope, «Peter the Roman» according to the prediction of St. Malachy, means the beginning of Armageddon. Nostradamus also informed that the Woman in tiara – Pope with new keys of heaven will appear simultaneously with the beginning of the apocalypse. A lightning strike in the dome of the Basilica, erected over the tomb of the Apostle Peter, that came shortly after the resignation of Benedict XVI, marked the end of the popes’ line initiated by St. Peter and the beginning of the apocalypse. It is considered that Nostradamus presented some of his predictions in the pictures. 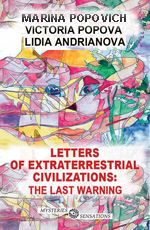 By warning humanity about the beginning of global cataclysms, which will be accompanied by moving of tectonic plates, he reveals the direct descendant of King David – the Woman whom are transferred from the Above the Instructions for humanity’ Transition to the secure Highest level of the material world, and indicate the date of her birth. To the Woman are given from the Above also two keys for reading these Instructions written in symbols of consciousness. That’ s why in many pictures Nostradamus portrays the Woman in the papal tiara. All stages of the Transition to the new cycle of life to immortality through the universal resurrection are entrusted from the Above to transfer to mankind to the Woman and her sister – the direct descendants of King David. Decoding of Nostradamus' pictures are presented in five parts. Pictures of Nostradamus inform: simultaneously with the cataclysm of enormous destructive power, which will lead to the emergence in the world of high radiation level, and will mark the beginning of global cataclysms of the planet’ destruction, will appear the Woman with the two keys given to her from the Above for reading the Instructions, written in symbols of consciousness for humanity's Transition to the safe Highest level of the material world. These are just the keys to the kingdom of heaven, that’s why the Woman is depicted in the tiara, which is the arrow-pointer meaning that just to her were given from the Above the two real keys. This woman is a direct descendant of King David. The Transition is the only way of salvation specified from the Above. So, before the start of global cataclysms from the Above was made the replacement of the keys– the symbolic keys, which owned the papacy nearly two millennia, on the real keys. The Transition of mankind will happen if humanity overcomes its nature and turns over consciousness from hate to mutual understanding and love. Incredible importance of this decision highlights the inverted cross of St. Peter. In the picture the Red Cancer Nostradamus informs about the features of the third of three preliminary cataclysms of incredible destructive power associated with high-temperature processes and the huge loss of people. He reveals the causes of cataclysms – the divergence of tectonic plates, and also warns about the occurrence of high levels of radiation on the planet. From the Above is given only way of salvation – humanity has to leave the level of the Crystal structures, where it now lives, and to make the Transition to the safe Highest level of the material world through the unification of consciousness and caused by it the laser beam. The Transition has to be made before the second preliminary cataclysm, because the remaining number of people will not be able to start the mechanism of the Transition and will be destroyed by global cataclysms of the planet’ destruction beginning soon.About all this information warns also Stonehenge and other complexes with the effect of solar beam. The Transition of humanity into the next cycle of life to another level of the material world, as well as the causes and events that will force mankind to make it – that is the main leitmotif of Nostradamus’ drawings-pictograms. Inverted upside down Big Leo shows that humanity has radically to overturn the consciousness from hate – to love and mutual understanding. Three poses of Lion – lying, jumping and running, in which he is depicted in the pictures - show three phases of a laser beam for the Transition. Nostradamus, foreseeing deadly attacks of beginning of global cataclysms, and deeply worrying about the success of the Transition as the way to the universal resurrection of Earth’ mankind, warns about the death danger of delay. He speaks to each of us with a great request – to change the callousness, indifference and hate in our heart for love, mutual understanding and forgiveness, because only with such basis of consciousness our civilization will be able to make the Transition. This is the basis of consciousness of the future. For mankind with the other principles of mutual relations the way to the future is closed. December 21, 2012 is the beginning of great changes on the planet. The end of the Mayan calendar means that the cycle of Consciousness of humanity on Earth is over, and global cataclysm of the planet’ destruction will start up. Ending the cycle of Consciousness means that the consciousness of humanity has reached the highest level in the harmony parameters of the planet Earth and have to continue improvement in the next cycle. 2012 and 2013 are the years of the preparing to the beginning of global cataclysms. 2012 year of the Black Water Dragon passes on the baton of natural disasters to the year 2013 of The Black Water Snake. The main condition for the continuation of life is the humanity Transition to the Highest safe level of the material world before the second pre-cataclysm. There will begin the next cycle of life – the cycle of Correction. December 21, 2012 is the beginning of a new era – the immortality of humanity! Sandy hurricane that swept across the East coast of the United States in autumn 2012, and the tsunami of 2011 in Japan clearly showed that humanity can not go through any, even the weakest blows of nature. ETC inform that mankind can not even imagine the force of natural catastrophes, that will face before the start of global cataclysms. ETC warn about the beginning of global natural disasters of the planet' destruction as a result of the transition of Earth from the group of the planets of the present development of consciousness into the group of the past. Mankind has not understand the laws of nature yet, and may be destroyed. ETC indicate the only way for the continuation of life – the Transition on the safe Highest level of the material world. The Transition can be made through the synchronous unification of the consciousness of all humanity, based on love and a deep mutual understanding. We are the people of one destiny, because we can not leave the planet and have to feel great joy because we have the opportunity to continue life, through the Transition. We will make it in time, despite on very short period of time. The first preliminary cataclysm of incredible power will completely overturn the life of humanity and will change the values. The main value will be the life, so it will be made the decision about immediate Transition of the civilization to the safe Highest level of the material world. From that day will begin the phase of active destruction of the planet – the uncontrollable process, which can not be stopped. Before the first preliminary cataclysm civilization of Earth has to be completely informed about the upcoming events and the necessity to make the Transition through synchronous unification of consciousness of all humanity. In the new cycle of life – the cycle of Corrections everyone will be responsible for the actions, which he made during the life. The cycle of Correction will be so incredibly long, as if we gain immortality. It remains quite a bit of time before the Transition into the cycle of Correction. Hurry up to do good! Extraterrestrial civilizations reveal to humanity dangerous and safe places on the planet during the preliminary cataclysm. We all have a common destiny, and only together can we make the Transition to the future – into the new cycle of life on the Highest level of the material world before the beginning of global cataclysms. Today is known the dates of the start of all three preliminary cataclysms – is not known only sequence of their occurrence. In addition, it is known also, that the Transition can be made only until the second pre-cataclysm, because after it number of people will not be enough to start up the mechanism of the Transition. ETC warn that, in accordance with the scenario before the start of global cataclysms will occur three preliminary. After the first pre-cataclysm on earth will arise high level of radiation due to the destruction of nuclear power plants placed on the way of natural blow. System of communication will be broken. Mankind has to make the Transition before the second pre-cataclysm. For the Transition will be allocated only a small period of time – just a few months, not more than half a year. ETC will not allow the change of the planet’ poles before the Transition, because otherwise humanity will be destroyed. ETCs have expressed an ultimatum of the universe’ consciousness – unification of consciousness – laser – the Transition or destruction – by a symbol of the «cross». Complete destruction will await civilization not uniting consciousness and not made the Transition into the next cycle of life before the second pre-cataclysm. The symbol «cross» is represented in many complexes with solar effects. A beam of sunlight is the arrow-pointer indicating the last hours of living on Earth civilization in any way – making right or wrong decision... However, hope is not lost, because this beam of sunlight on the other hand, represents a laser beam, which caused the action of the civilization’ united consciousness for the Transition. 2012 – year of the Black Water Dragon – will bring people big prompt changes. In symbolic of extraterrestrial civilizations: the Dragon is a symbol of global cataclysms. Water means that epicenter of the first pre-cataclysm will arise in the ocean at coast of the South America in the Brazilian anomaly, in a place of the weakest magnetic field on Earth. Black – the color of mourning – means a lot of a grief from the huge losses of people as a result of the first pre-cataclysm. Extraterrestrial civilizations (ETC) warn about beginning of global cataclysms and three preliminary cataclysms of improbable force with a short time interval between them. These catastrophes are a result of Earth’ magnetic field decreasing. ETC confirm that global cataclysms will never stop and will become only stronger. The only way for humanity’ salvation is the Transition from the level of global cataclysms where we live now to the Highest safe level of the material world. The Transition can be made only through synchronous unification of all civilization’ consciousness. This information of ETC is transferred by thousand created by them objects worldwide, forming the System of Information Transmission. 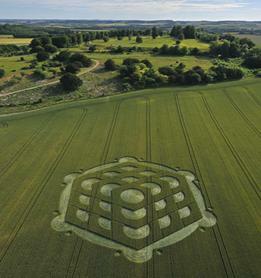 Crop circles are the last ETC steps-instructions for the Transition.